.. getting closer to or further from the subject will dramatically change the perspective of the moon to a given subject. The moon is always going to be rendered at approximately .55º in any lens' angle of view. A brief overview of angle of view before we move on: Attached to a 35mm camera, A 17 mm lens has an diagonal angle of view of 103.57º. A 600mm lens has a diagonal angle of view of 4.12º. If the moon takes up approximately .55º of space inside the viewfinder with any lens attached, it is easy to see that the moon is going to occupy more space within the 600mm view than the 17 mm view. (Read a more in depth tutorial on Angle of View ). Moving forward to the image here, I knew I wanted that a huge moon relative to the Holy Hill Cathedral. Given the knowledge from above we'd deduce that a 600 mm lens choice (or longer) would be the likely candidate to pair with our camera body. Remember, the moon will take up .55º of real estate inside my viewfinder and the rest of the space inside that 600 mm is a diagonal angle view of 4.12º. We could fit eight moons inside the viewfinder diagonally. Question:Where were you standing? In the parking lot? Or on the road? Before I get into the answer, which takes into account the second part of the equation: large focal length + x = Big Moon relative to subject I'd like to address an idea as to why a person would come up with such a question. It's a very good question and begs some investigation as to its origin. First, when we see a building looking smallish inside the frame of a picture, we most often think of shorter focal lengths. Many times a photographer will stand 'locked' into a position and use a zoom lens to 'take in' or 'let out' the subject. Generally we think of the photographer as being relatively close to the subject. I think it makes sense that this is what would normally cause a person to assume that I was close to the cathedral (in the parking lot perhaps). But then the second part of the question appears due to the huge size of the moon relative to the cathedral. 'On the road?' is the question that asks for more information because it doesn't seem to make sense that the moon is so large if 'she's in the parking lot'. The question pleads for the x in the equation. Because in the second image shown here I am standing in the parking lot with a 600 mm lens. If you look at both of the images you can derive (just by sight) that the moon occupies the same amount of space in each frame (even though one is full and one is crescent). The perspective is different. In the first, the moon appears huge and roughly same size as the cathedral. In the second the moon appears smaller than just part of the spire. In the first the cathedral seems small and in the second the spire appears large; relative to the moon. So what is this magical x which affects the moon to subject perspective with my 600 mm lens? It is the near and far distance (you and camera) to or from the subject respectively that changes the apparent size of the moon relative to the subject. We have answered the question but there is still some explaining to do. If the angle of view (AOV) is a constant in my 600 mm lens and consistent in the moon, then why would proximity to or from my subject make a difference? Why will my cathedral look small and the moon big in the first image? 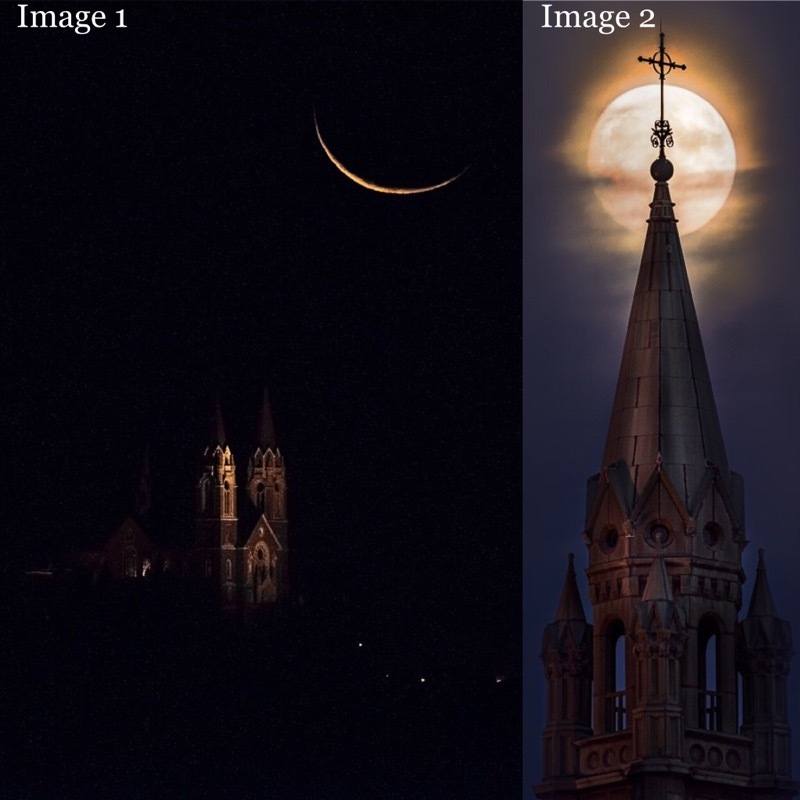 Why will the spire look huge and the moon smaller in the second image? Now is the time to look at the difference between angle of view and field of view. the 600 mm lens' diagonal AOV is 4.12º. This is consistent at whatever distance from the subject. However, with increased distance from the subject, the FOV also increases. AOV is expressed in degrees and FOV is expressed in meters, feet, inches, miles, etc. Shown over 360º of possible sight. A 600 mm sees roughly 4º of view (very small). 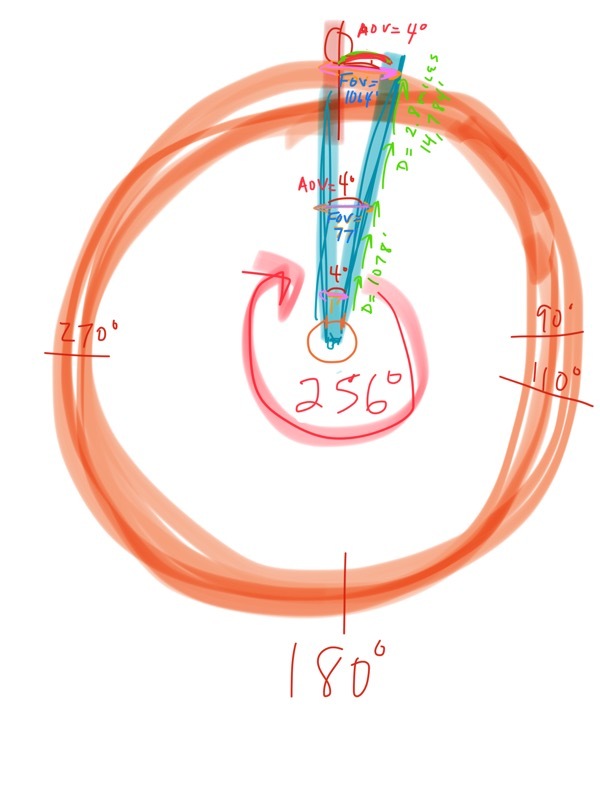 This diagram shows how over distance the AOV does not change, but the FOV does. The closer I am to my subject (with any lens) the smaller my field of view. In the parking lot, at 1078 feet away my field of view stops when I register my focus on the spire. 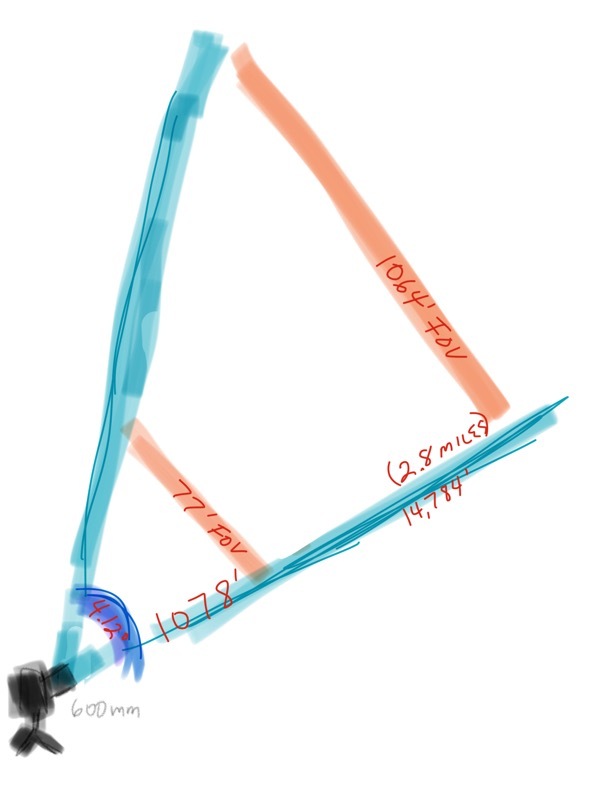 My diagonal FOV is 77 feet and my AOV is still 4.12º. The moon is still approximately .55º. The cathedral is 191 feet tall from base to spire. At a distance of 2.8 miles it becomes clear as to how the cathedral fits into and even looks small within my 600 mm set up. The moon is always going to take up the same amount of room within the frame. Therefore, the moon looks especially large the further I get from my subject (as long as I can still see my subject). At a distance of 1078 feet I can't fit the entire 191 feet of cathedral into my field of view. Therefore the spire looks large relative to the moon, which is always going to take up the same amount of room within my frame with the 600 mm. Notes: **I've been talking in the language of diagonal AOV and FOV to keep things simple, but there is more extensive use for understanding horizontal and vertical FOV as well. I will cover more of that in an upcoming tutorial. ** more to be covered regarding angle of view here. ** more to be covered as to how to know how far away to be to achieve a huge moon relative to subject (based on subject's height and trigonometry).